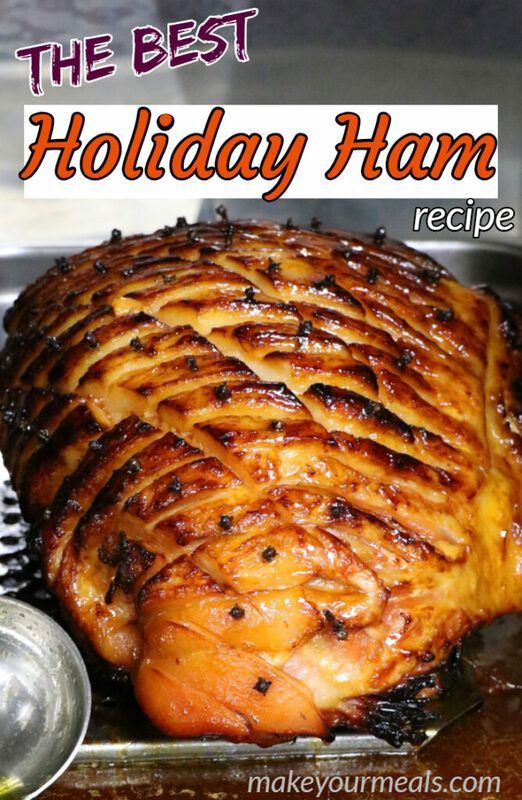 I have been making this Glazed Holiday Ham recipe for over 20 years and my family absolutely loves it! Every Easter and every Christmas, they are the first ones to ask if I will be making my ‘special’ ham for dinner. The ham being served for our holiday dinner. The answer is always ‘of course, it wouldn’t be the holiday without it’! Growing up we always had a Honey Baked Ham on our table for these two holidays. Either my parents would order one at least a month in advance, or they were gifted one by their employer. But either way you could be sure that this delicious ham would be on our table once the family gathered around. However, once I was out on my own, I knew that I couldn’t afford the cost of a true Honey Baked Ham. 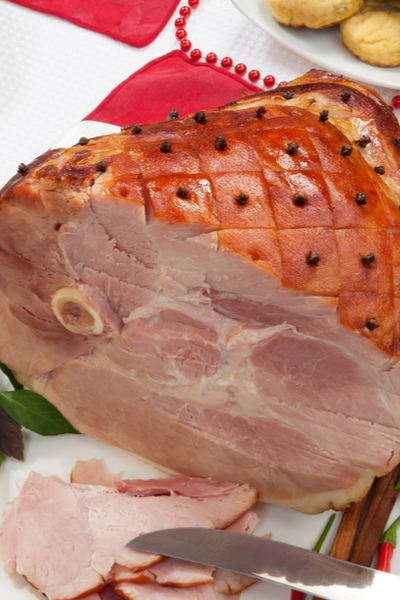 We prefer to use bone in hams for our Holiday dinners. They provide so much more flavor than their boneless counterparts. Instead, I had to come up with my own Honey Glazed Ham recipe. It turned out absolutely delicious and I didn’t think I would ever make another type of ham. However, that all changed when I planned poorly for a last minute trip to the grocery store. I totally forgot to add pineapple juice to my list and I came home to find neither in the grocery bags or in the kitchen cupboard. To me, that is what made the Honey Glazed Ham so good! Once you score the exterior surface of the ham, place one clove in the center of each diamond. So instead of panicking, I turned to Plan B.
I took a look in the pantry to see what I could come up with! My first thought was to simply substitute the pineapple juice with orange juice. People have been making ham with this honey and orange juice for years. But guess what, I had only a few tablespoons of honey left in the jar. Now I really had to scramble. I had guests coming over in just a few hours and I had to do something! Yes, I could attempt to use the packet of glaze seasoning that came with the ham. But honestly, I didn’t trust it. 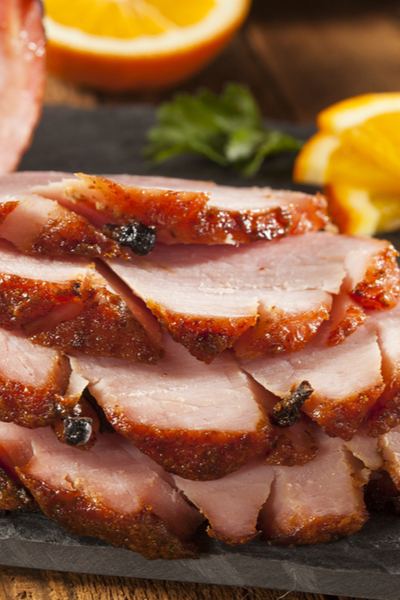 Orange Marmalade makes for the perfect addition to any Holiday Ham recipe! Who knew what ingredients were in that packet. So, I figured that I would take one last look around the kitchen to see what I had on hand to make the glaze. I had enough brown sugar and Dijon mustard to start the base of the glaze. However, I needed a thinner substance to blend it all together. That is when a jar of my homemade orange marmalade literally fell into my hands. And by literally, I mean that as I was looking in the back of my pantry, and I accidentally knocked a mason jar off the shelf. Luckily, I was able to catch it before it hit the ground. Once I went to replace the jar on the shelf, I realized that it was orange marmalade. It was like it was a sign! Once the ham is almost done, add the glaze every 15 minutes for the best flavor. 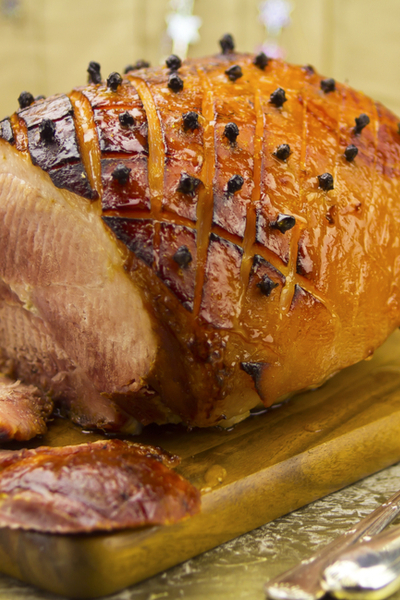 I could use the marmalade to make our Glazed Holiday Ham! 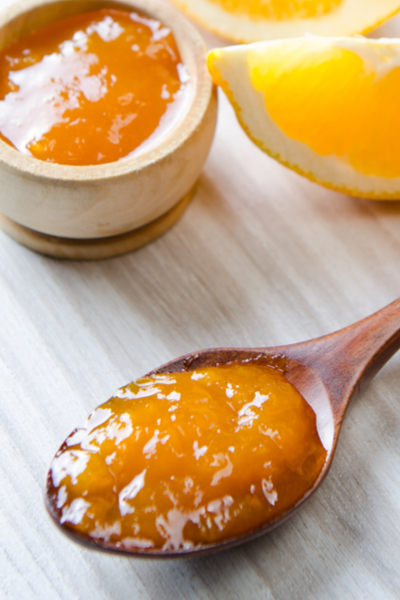 We use orange zest anyway, so I thought it would be a great addition to our glaze recipe. We typically buy an already cooked ham. In fact, I don’t think that I have ever cooked a raw ham for a holiday dinner. I just didn’t want that extra stress of making sure that it was cooked to the correct internal temperature on an already hectic holiday. However, one thing that I remember from being in the kitchen with my parents and grandparents is to always purchase a bone-in ham whenever possible. The bone provides so much additional flavor during the cooking process. Allow the ham to rest before slicing. Trust me, it is worth it! Therefore, my only job was to prepare the glaze that could wow my family and friends. And the combination of brown sugar, Dijon mustard and marmalade did just that! The glaze immediately adhered to the outer surface of the ham when I spread it on with our pastry brush. As I continued to spread additional layers of glaze, the ham began to develop a light crust that looked and smelled delicious! In fact, it took everything I had not to take a little bite as soon as it was removed from the oven. But when I finally got a chance to sink my teeth into that Glazed Holiday Ham, I fell in love. The flavor of the glaze perfectly complimented the slices of ham. Pin me on your Pinterest Board! 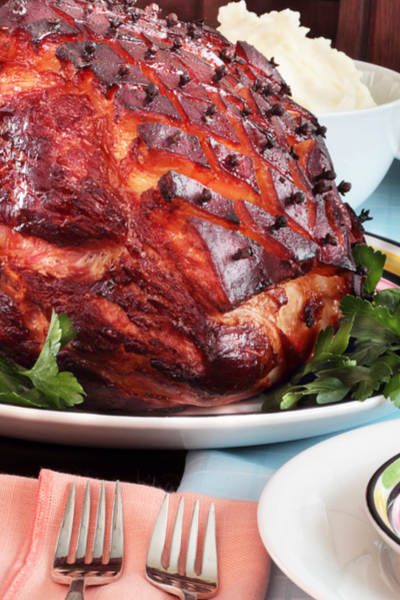 In fact, everyone loved it so much that this now has become our go-to Holiday Ham recipe. However, if you don’t have room in your oven this holiday, be sure to check out our Instant Pot Bone-In Ham recipe. 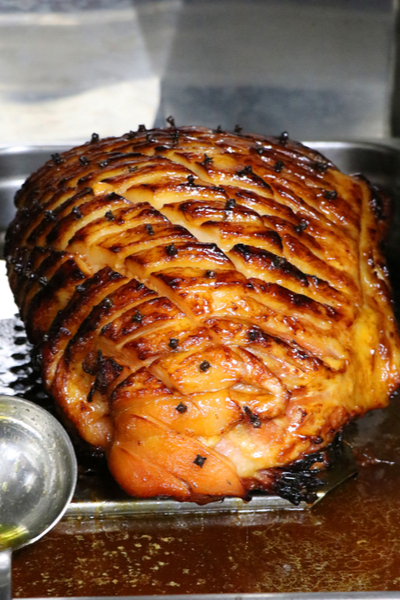 Moist and delicious glazed ham that we serve every Easter and Christmas dinner. Score the surface of the ham ½ inch deep in one direction, and then in the opposite direction, making diamond shapes. Insert a whole clove in the center of each diamond. In the bottom of a roasting pan, add the lemon lime soda. Place a cooking rack in the plan and place ham cut side down on the rack. Bake, uncovered, at 325°F for 2 hours. In a small bowl, combine the brown sugar, mustard and orange marmalade, set aside. Brush the glaze over the ham. Bake 45 minutes longer, brushing the glaze over the ham every 15 minutes or until a thermometer reads 145°F. Serve remaining glaze with sliced ham.